The Town of Ibiza is the capital of the Spanish and Balearic island of Ibiza. The official territory of Ibiza Town (Eivissa in Catalan) covers only one square kilometre. 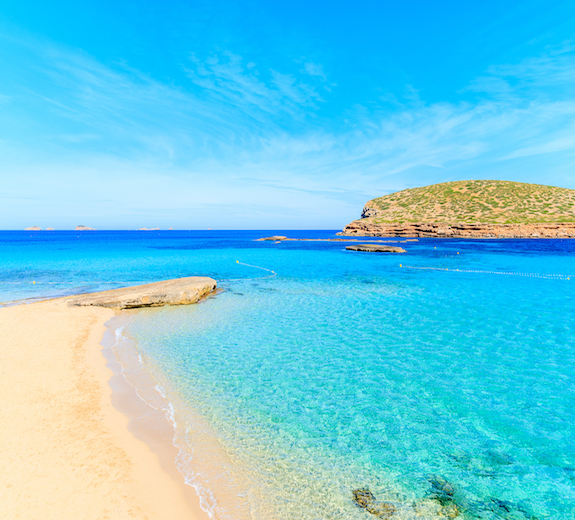 However nowadays, the surrounding regions and the original nucleus are known together as Ibiza or Eivissa,and make up a combined total of 11.40 square kilometres. The Port of Marina Botafoch and the beaches of Talamanca and Figueretes also belong to Ibiza Town or Eivess. The count of 50,000 inhabitants is actually rising each year. Ibiza may be an island, but thanks to its airport only 8 kilometres from the town centre it is easily accessible by plane. When leaving the airport, there are several taxi companies and public buses (line 10) to take you rapidly to your destination. You can also opt for hiring a car for your holidays. Ibiza is a town of contrasts and surprises. 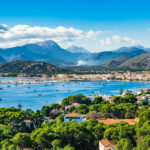 As opposed to Sant Antoni de Portmany, the definitive party town of the island, Ibiza Town is particularly attractive, both culturally and intellectually. 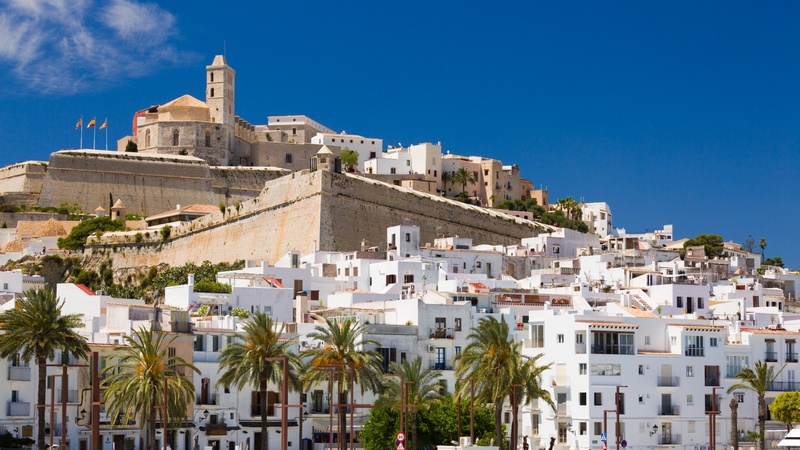 You can of course find nightclubs in Eivissa, but it is above all a lovely historic town,and Dalt Vila, the ancient heart of the city, was declared a UNESCO World Heritage Site in 1999. 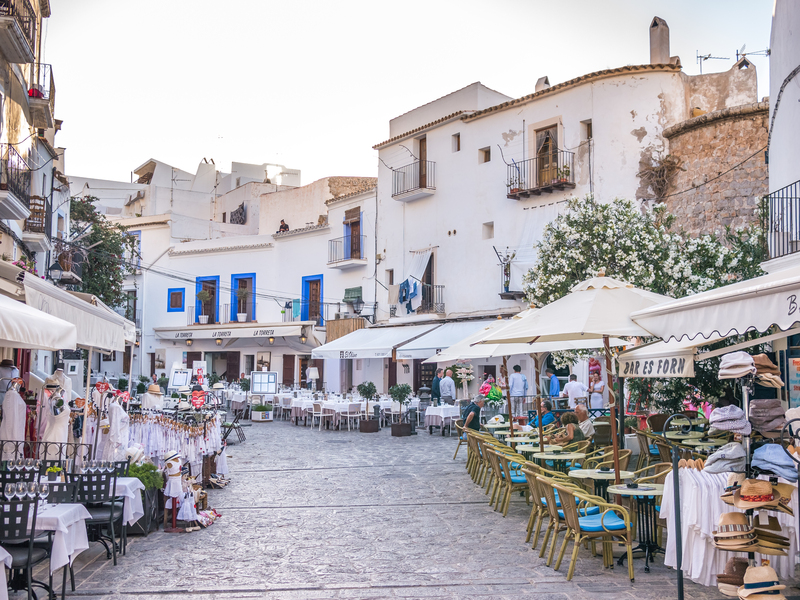 At the foot of Dalt Vila are the districts of Sa Penya and La Marina, where you will find the best boutiques, restaurants, and bars for the enjoyment of tourists. In the evenings, the bars and nightclubs open their doors and the nightlife becomes animated, but the revellers are much less noisy here than in Sant Antoni. Take a pleasant walk along the ramparts and the small streets of the fortified town of Dalt Vila. From the port, on the summit of a hill surrounded by walls that date back to the 16th century, we can see Dalt Vila, the heart of the old town. The houses with their gothic windows have a rustic, mediaeval character. 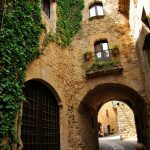 Their crumbling façades are hidden by a coating of lime or a flowered trellis. The Portail de ses Taules gives access to the ancient town of Dalt Vila. A steep slope takes you up to the summit, where the Cathedral Santa Maria de las Nieves overlooks the town. The tower and porch of the sacristy date from the 16th century. The Baroque elements lead us to believe that the rest of the building dates from the 18th century. In the Museum of the Sacristy, you can admire the gothic and baroque paintings and the treasures of the church. 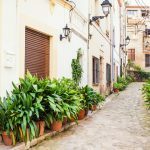 During a pleasant walk in the old town of Ibiza, you will come across a labyrinth of narrow streets. If you wish to know more about the local culture, visit the Museu d’Art Contemporani, where you can admire and buy works of art from the artists of Ibiza. In the archaeological museum on the Cathedral Square you will find ancient sculptures, ceramics and antique coins. Surrounding the Plaça d’Espanya, many beautiful buildings can be seen, such as the former convent which now houses the Town Hall, the church of Santo Domingo with its magnificent painted ceiling and tiled floors, and a house with a beautiful painted facade. Down a side road, Carrer Pere Tur, we find more amazing buildings that date back to the 18th century. The La Marina district can be located near the Port of Ibiza, from where the ferries leave for the neighbouring islands of Mallorca, Menorca and Formentera. This district used to house the workers of Ibiza in bygone days, and is now a very lively place with shops, offices, banks, restaurants and an exuberant nightlife. The shops are open here until midnight, and afterwards one can party until the early hours of the morning in the many bars, pubs and nightclubs. Some of the clubs go back to the hippy era. 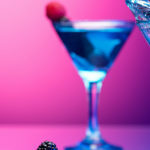 The biggest nightclubs are without a doubt Pacha, Amnesia, Privilege Ku Club, Space and El Divino. 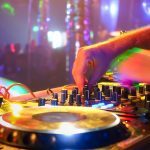 Some of the discotheques can welcome more than a thousand revellers, and world-famous DJs come to spin their discs. Between the old town of Dalt Vila and the port of Ibiza is the ancient fishing district, Sa Penya, the oldest part outside of the city walls of Eivissa. It is perhaps best not to frequent the poorest districts of Ibiza Town. Better stick to the streets where the busy nightlife is. In the narrow Carrer de la Verge, probably the most sensational street in Ibiza, you will find the gay clubs, SM clubs and drag queen shows. It is from here that the drag queens and dancers start their parade. Amongst the numerous nightclubs you can also find boutiques, and in Carrer Enmig there is a unique hippy market where you can buy anything. In the new district of Ibiza Town you will see modern houses, hotels, banks and interior design shops. 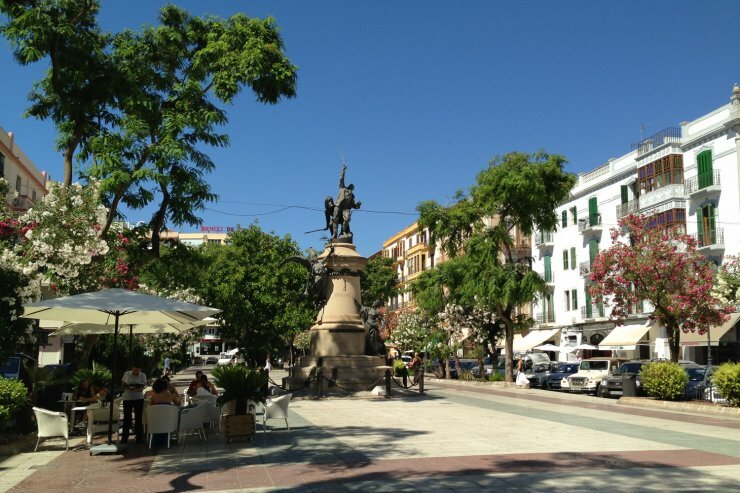 The Vara de Rey is an attractive boulevard with great little restaurants and pretty shops. There are no monuments to visit, yet the romantic ambiance of Ibiza is still present. 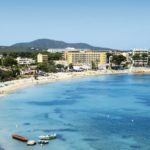 The town itself does not have any beaches, but south of Ibiza Town there is the small resort of Sant Jordi de Ses Salines with its beach, Playa d’en Bossa, one of the largest on the Island. This beach is a magnet for the young, probably due to the presence of the Space Club. Further south still is Ses Salines and its beach, Playa de Ses Salines. On the outskirts of Eivissa, you can sunbathe on Figueretas beach, where you will find sunbeds and parasols available to hire. Are you tempted by this surprising holiday destination? Reserve your holiday home now at Club Villamar. Find and reserve a luxury villa in Ibiza!